Nothing beats hanging out at the lake. When the weather is warm and sunny, like it was today, the lake has a magnetic effect around camp, congregating campers, especially during the free swim period right before lunch. 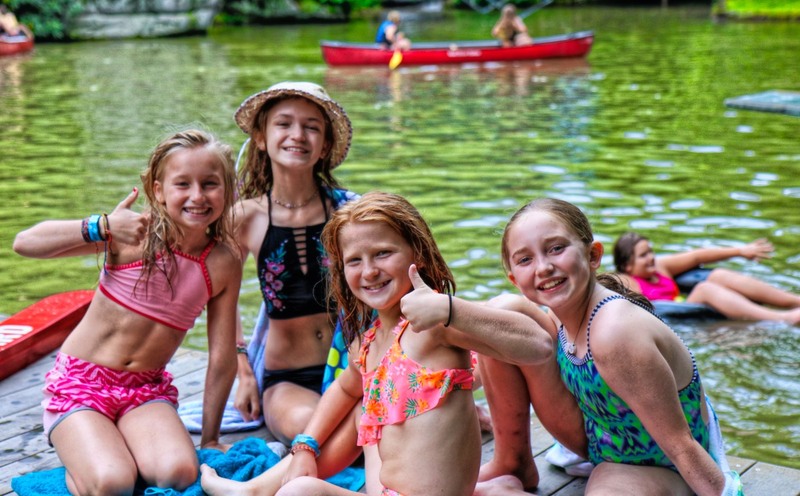 With girls swimming mermaid laps, doing tricks off the diving board, zipping down the water slide, paddling a corcl boat, floating in a tube, or just hanging out on the dock or sunbathing on one of huge rocks nearby, there’s a lot going on. The whole waterfront might have 60 or so people all enjoying the festive atmosphere during free swim. It’s a classic summer camp scene that the girls can count on being part of their day. Curosty, the historic log cabin that’s home to the fiber arts activities at Rockbrook, is responsible for a great deal of the decoration we find around camp. 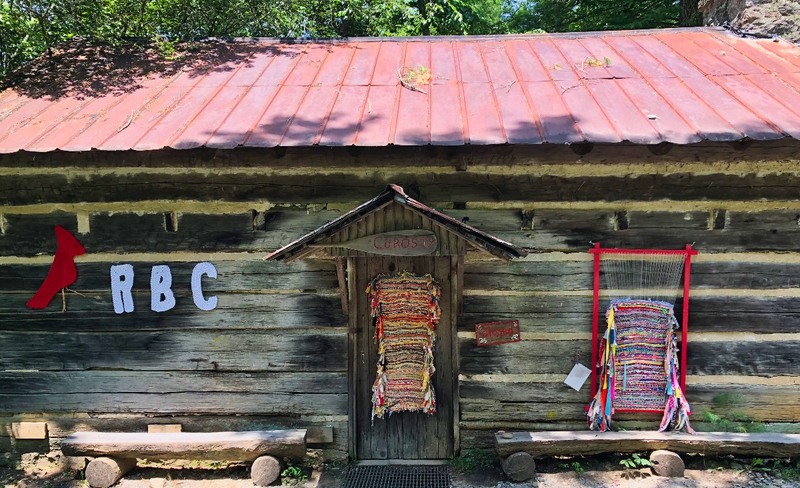 Campers of course love all the weaving going on— basketry, floor looms, lap looms and hoops —the knitting projects, the crochet hooking, and the cross stitching. 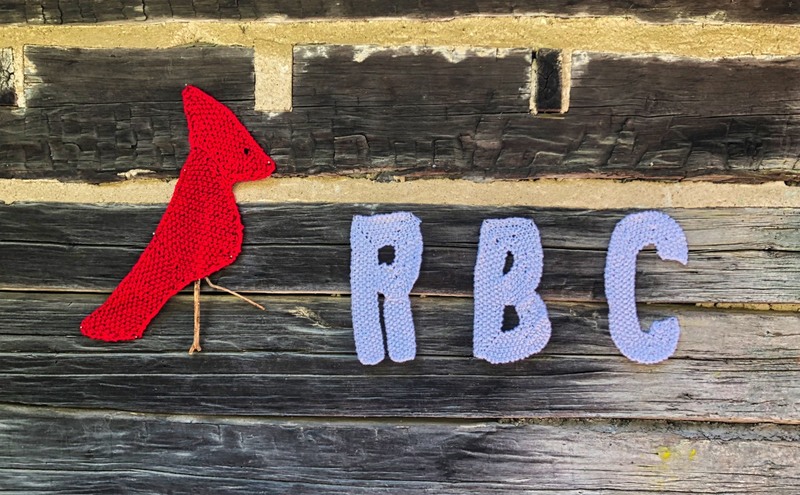 Beautiful hats, belts, baskets, pot holders, book marks, and place mats are happily produced everyday in Curosty, as the girls develop their needlecraft and weaving skills. In addition, there are community projects to admire. Right on the door of Curosty is an example of a large woven tapestry that dozens of girls have worked on. Row-by-row, campers of all ages took turns adding different colorful strips of cloth, adding weft to a large warp on a frame. You can see another of these tapestries in the works to the right in the photo. One of these weaving projects ended up being about 15 feet long, and now serves as a colorful cushion for the dining hall porch bench. Many of the red rocking chairs around camp likewise have similar handmade seat cushions. Rockbrook is more comfortable and colorful thanks to Curosty. 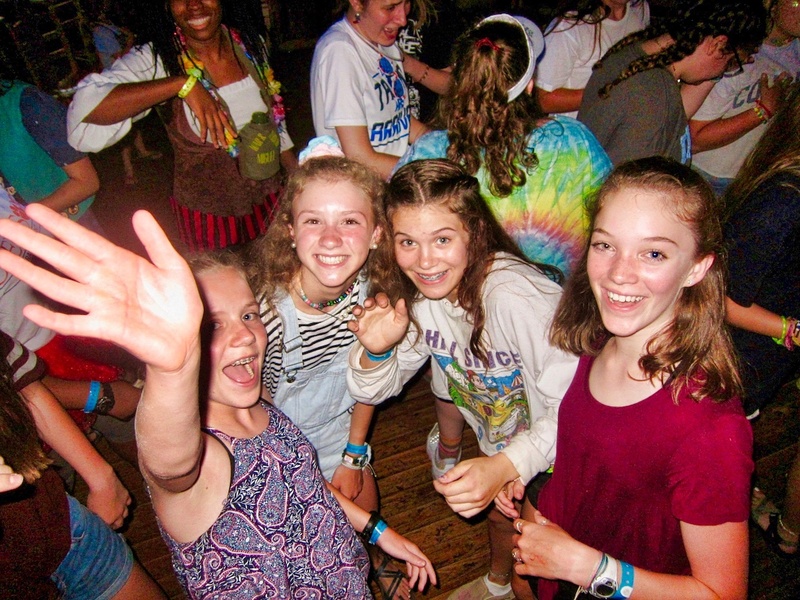 Even though most of the older campers had guessed it, the announcement that we would be having a dance with Camp Carolina tonight raised the roof with screams of excitement. Clearly, everyone was looking forward to this traditional all-camp event. Specially chosen outfits and costumes were ready to pulled out, hair washed, braided and brushed out. 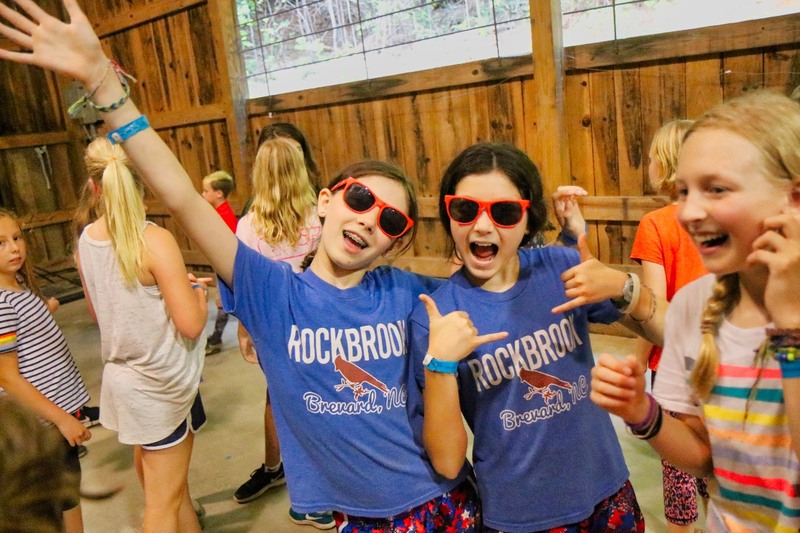 Again, we organized two dances, keeping the youngest girls here at Rockbrook to welcome the smallest boys from Camp Carolina, and transporting our Seniors and Hi-Ups over there to dance with the older boys. You can see from the photos below that the mood at both dances was exuberant, effervescent with high spirits. For the entire hour and half, there was more singing and screams of excitement than not, as conga lines and group dances formed, and favorite pop songs followed one after the other. A short break for a homemade Rockbrook cookie didn’t slow things down one bit, either. Tonight proved once again that these dances don’t have much to do with the boys. There’s perhaps the occasional sashay, especially, as you might expect, from the older girls, but mostly the fun comes from being silly with your friends, dressing up, and jumping around (“dancing”) to familiar songs. It seems to me, it’s the girls, not the boys, that make these dances fun. That’s not too surprising when you consider the impressive power (energy for fun) this group of girls can generate. Very impressive, indeed!